The Duke Blue Devils start their pursuit of the sixth national title in program history when they take on the North Dakota State Bison on Friday in an NCAA Tournament East Regional first-round contest. The Blue Devils are the top seed in the East and the No. 1 overall seed in the tournament after they captured the ACC Tournament title. They are 3-0 since the return of electric forward Zion Williamson, the freshman who missed six late-season games because of a knee injury. Duke (29-5) hasn't reached the Final Four since winning its last title in 2015. The Bison (19-13) already have an NCAA Tournament win to their credit as they knocked off North Carolina Central 78-74 in a First Four play-in game Wednesday. The Blue Devils are 26-point sportsbook favorites and the over-under total points scored is 148.5 in the latest Duke vs. North Dakota State odds. Before you lock in your Duke vs. North Dakota State picks, check out the 2019 NCAA Tournament predictions from the SportsLine Projection Model. This model, which simulates every game 10,000 times, has raked in the winnings for those following its picks. Over the past two years, the SportsLine Projection Model has returned more than $4,000 to $100 players on its top-rated college basketball picks. It also entered the postseason on a strong 11-5 run on all top-rated college basketball picks. Anyone who has followed it is way up. Now, it has locked in on Duke vs. North Dakota State. We can tell you the model is leaning over, but it also also generated a strong point-spread pick that hits well over 50 percent of the time. That pick is available only at SportsLine. The Blue Devils have history on their side when it comes to avoiding a potential loss to a No. 16 seed. Not only was Virginia's loss last year the only time a top seed has fallen, Duke has rolled by double figures every time it has held a No. 1 seed with one exception. Its closest first-round game as a top seed came in a seven-point win over Mississippi Valley State in 1986. Although Duke's freshmen stars get the majority of the headlines, and mostly for their prowess on the offense end, the Blue Devils have gradually improved on the defensive side. They will get a boost in that department with the return of center Marquis Bolden, their best post defender. 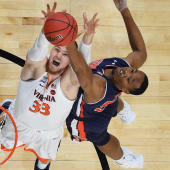 Bolden hasn't played since suffering a sprained knee March 9 against North Carolina, but he is expected to play Friday. However, the Blue Devils are far from assured of covering the Duke vs. North Dakota State spread against a Bison club that will be playing with confidence following its First Four victory. The Bison built a 40-34 halftime lead and pushed the margin to 13 early in the second half. But, as is common in a single-elimination format, the Eagles mounted a comeback and took a 61-59 lead with 7:01 remaining. They pushed the margin to five before North Dakota State responded down the stretch with a series of clutch baskets, free throws and defensive stops. Tyson Ward made a free throw and followed that up next possession with a layup to put the Bison up for good at 73-70, and they closed it out with a series of strong defensive stands. They finished 19-of-24 at the free-throw line (79.2 percent) and shot 48.1 percent from the field. A dangerous 3-point shooting team, the Bison have won five straight. Who wins North Dakota State vs. Duke? And which side of the spread hits in well over 50 percent of simulations? Visit SportsLine now to find out which side of the North Dakota State vs. Duke spread you should be all over Friday, all from the model that's up more than $4,000 on top-rated college basketball picks the past two seasons.